The Secrets of the Castle by Aaron M. Zook Jr.
We’d love your help. Let us know what’s wrong with this preview of The Secrets of the Castle by Aaron M. Zook Jr.. Preview — The Secrets of the Castle by Aaron M. Zook Jr. Intrigue and danger surround two young boys and their dogs as they see to unravel a castle mystery. To ask other readers questions about The Secrets of the Castle, please sign up. Got to a little past page 60 before I couldn't do it anymore... People say that the brother's are very realistic, but I do not. The rivalry passed from a rivalry to just plain mean, and the parents were... okay with it? It also wasn't very interesting and I felt like I was being talked down to. No disrespect towards the author, I just will not be continuing this book or this series. Growing up, I devoured mysteries. It didn’t matter to me if the hero was a boy or a girl – Trixie Belden, The Hardy Boys, Danny Orlis – I loved the stories. I still love the suspense genre and it was so fun to read The Secrets of the Castle by Aaron Zook, Jr. It took me back in time to those adventures with “kids like me”, even though I’m a much more mature kid now! Gabe and Alex Zanadu are growing up as ‘Army brats.’ Living in Germany with their parents, they are home-schooled by their mother wh Growing up, I devoured mysteries. It didn’t matter to me if the hero was a boy or a girl – Trixie Belden, The Hardy Boys, Danny Orlis – I loved the stories. I still love the suspense genre and it was so fun to read The Secrets of the Castle by Aaron Zook, Jr. It took me back in time to those adventures with “kids like me”, even though I’m a much more mature kid now! Gabe and Alex Zanadu are growing up as ‘Army brats.’ Living in Germany with their parents, they are home-schooled by their mother while their father works in Army Intelligence. The story is told from the POV of 12-year-old Gabe who comes across as a bit bratty – typical younger brother – but very smart. Alex is the older, slightly superior, very analytical brother. Their dogs, Thunder and Lightning, are highly trained and understand every command the boys give them. The Zanadu family vacation is taking them to Neuschwanstein Castle where the boys have heard there are caves to explore and secrets to uncover. Everywhere they go, their dogs go with them – inside restaurants, on the castle tours, etc. (This was actually surprising to me since these weren’t necessarily service dogs.) Gabe is most interested to discover if the early engineer’s drawing of Neuschwanstein Castle that he found in a German library archive is true. The drawing details a secret tunnel connecting Neuschwanstein to Hohenschwangau Castle but local lore says the tunnel does not exist and never has. When strange things start happening and the map goes missing, Gabe’s curiosity nearly explodes. Can the boys and their dogs stay safe amid the threats swirling around them? Will their survival skills be put to the test? This was a very exciting adventure and I would highly recommend for any young mystery reader. The story is fast-paced and I also loved the history lessons incorporated into the tale. I received this book from bookfun.org in exchange for my honest review. This book was so intriguing. Not only did I learn some things about Germany, some German words, but I also got caught up in the mystery of the story itself. Two brothers are on a homeschooling field trip in Germany. Their father is military and they are stationed there for a while. They also have trained dogs who are smart and obedient (for the most part). As a homeschooling family they use every opportunity to make the best of their education and learn things hands on. But this field trip, per s This book was so intriguing. Not only did I learn some things about Germany, some German words, but I also got caught up in the mystery of the story itself. Two brothers are on a homeschooling field trip in Germany. Their father is military and they are stationed there for a while. They also have trained dogs who are smart and obedient (for the most part). As a homeschooling family they use every opportunity to make the best of their education and learn things hands on. But this field trip, per say, turns a bit sinister as mysterious things keep happening to them. Together with friends, the boys and their family tour the Neuschwanstein Castle as well as another one in the area. Gabe is convinced there is a tunnel connecting the castles, but the locals say it's just a legend. All the same, he did have a map, until it mysteriously disappeared. A few strange happenings, a mysterious death threat, among other things have these boys in a tussle. Their usual banter has to be thrown aside as they now must work together to uncover the secrets and come out alive. Honestly, I kind of "fell in love" with this family and their dogs. Maybe it's because there was so much I could relate to - the field trips, the sibling rivalry, the homeschooling, the traveling, or the dogs. My kids had a set of dogs once named Thunder and Lightning just like these kids, even the same coloring from the description. It was easy to read, and I am sure my son is going to enjoy it. He is has already signed up to read it next! I have been sparking his interest by relating just enough of the story to keep his curiosity peaked. I can't wait to read the next book - The Salt Mines Mystery. This book should come with a warning, “Beware! Intense adventure ahead!” The Zanadu family is en route to Neuschwanstein and Hohenschwangau castles in Germany for a family vacation when these adventures begin. The story is told from twelve-year-old Gabe’s point-of-view, and he is all action and adventure. His brother Alex is fourteen and enjoys exploring, too, but he is more logical and thoughtful. Their dogs Thunder and Lightning are along for assistance, and friends Jenna and Pete are vacationing too. I did not want to put this book down. The action kept moving. The descriptions were thorough without being boring. The Christian element was there but was very low-key. This book is very appropriate for any child who reads well enough to read a book of this length, although parents will enjoy it as well. Highly recommended for all of those reasons! However, I was a bit surprised by the constant sibling rivalry. I don’t recall that from my own growing up years or from the years of raising my sons. Also, Gabe and Alex were rather experienced for their ages (in my opinion) in caving, rock climbing, archery, martial self-defense, and Military Police dog handling. By Aaron M. Zook, Jr. This is a book should appeal to middle grade boys. The Zanadu brothers are at present calling Germany home. When their family trip takes an unexpected and dangerous turn Gabe and Alex embark on an adventure that they weren't expecting. Gabe and Alex suffer from a healthy dose of sibling rivalry and competitiveness. And this tendency leads them into trouble at times. But they soon discover that if they hope to survive the latest trouble they find themselves they will have to work together. Like many kids Gabe and Alex occasionally ignore or forget what their parents tell them, which leads them to unwanted consequences. But through it all the boys learn some valuable lessons as they attempt to unravel the mystery they find themselves in. The boys dogs Thunder and Lightening are both a year old and expertly trained to follow commands, which is rather amazing. But the dogs were never taught to avoid food given them by strangers (a woeful gap in their training as the reader will discover). I was provided a copy of this book by the author through TBCN/BookFun in exchange for my honest review. What a great adventure book for late elementary tweens to read! It’s got mystery, bad guys, motorcycles, travel, tunnels, well-trained dogs, and mean big brothers! Twelve-year-old Gabe and his fourteen-year-old brother Alex live in Germany with their military dad and homeschooling mom. In this adventure they have gone to visit some Bavarian castles, chiefly Neuschwanstein (the Disney castle was modeled after this one). They have some amazing adventures and while doing so they mention all sorts of What a great adventure book for late elementary tweens to read! It’s got mystery, bad guys, motorcycles, travel, tunnels, well-trained dogs, and mean big brothers! What a great adventure book! It reminds me of the Hardy Boys books I read as a young girl. I remember when our boys were young and the struggle it was to find good adventure books. Wish this had been out there for them. Loved it from beginning to end. The message in this book was wonderful. Two brothers always competing and trying to one up the other realize they are better as a team. And with God's help and prayer a life lesson is learned. This story starts out with the Zanadu family on vacatio What a great adventure book! It reminds me of the Hardy Boys books I read as a young girl. I remember when our boys were young and the struggle it was to find good adventure books. Wish this had been out there for them. Loved it from beginning to end. This story starts out with the Zanadu family on vacation in Germany. Alex is 14 and Gabe is 12. They each have their dogs along with them, Thunder and Lightning. They are typical brothers always competing. Much to their surprise their vacation to the castles Neuschwanstein and Hohenschwangau ends up being an adventure of a lifetime. These boys are very well prepared thanks to their dad who happens to work for the FBI. What they don't realize is that they are in danger! Many strange things begin to happen like people trying to run them off the road, strange notes, the boys hotel room being broken into and their van too. What is all of this about? Does the map Gabe found about a secret passage way between the castles have anything to do with it? Do they really exist or are they just legend? All just a myth, right??? This is a must read for anyone young or old. It is an action adventure full of twists and turns, bad guys, secrets, caves, and mystery. I recieved this book from bookfun.org for an honest review. SECRETS OF THE CASTLE is the first book in a new adventure series for middle grade readers. Gabe is a twelve-year-old son of a military officer stationed in Germany. He and his older brother, Alex, are typical siblings who physically fight, argue, and tattle. However, when problems arise, they work together to solve a mystery and escape the many dangerous situations they encounter. 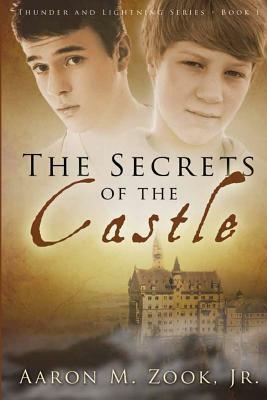 The parents are portrayed as intelligent and supportive, but they obviously have high expectations for the boys’ be SECRETS OF THE CASTLE is the first book in a new adventure series for middle grade readers. Gabe is a twelve-year-old son of a military officer stationed in Germany. He and his older brother, Alex, are typical siblings who physically fight, argue, and tattle. However, when problems arise, they work together to solve a mystery and escape the many dangerous situations they encounter. The parents are portrayed as intelligent and supportive, but they obviously have high expectations for the boys’ behavior and are USUALLY obeyed. The boys’ desire to experience excitement, whether it be finding secret passages or caving or climbing make them fun companions for the young readers. The family is endangered by mysterious people that follow them, threaten them and eventually kidnap them. They, and the reader, have no idea by whom or why they are being harassed. Physical courage and creative problem-solving, as well as their trusty dogs, Thunder and Lightning, lead to a satisfying ending. Although this could be read as a stand-alone, it obviously is the start of a series, with the boys fighting bad guys in whichever country they happen to be. There was a lot of information about Germany painlessly administered to the reader, and presumably, they will explore other locations in future books. I received this fun adventure through The Book Club Network in exchange for this my honest opinion. The year is 1989 and the Zanadu family is in Germany where the father is a major in the U.S. Army. Fourteen-year-old Alexander and twelve-year-old Gabriel are on a road trip with their parents to see castles when a tire blowout starts an adventure that becomes dangerous. This novel is told from Gabriel's viewpoint. When he finds out that the tire had been tampered with, he wonders if it has to do with his father's job in military intelligence. The family ends up at the famous Neuschwanstein Castl The year is 1989 and the Zanadu family is in Germany where the father is a major in the U.S. Army. Fourteen-year-old Alexander and twelve-year-old Gabriel are on a road trip with their parents to see castles when a tire blowout starts an adventure that becomes dangerous. This novel is told from Gabriel's viewpoint. When he finds out that the tire had been tampered with, he wonders if it has to do with his father's job in military intelligence. The family ends up at the famous Neuschwanstein Castle. Alexander and Gabe have many adventures, finding secret passage ways and avoiding bad guys until they are kidnapped. Middle school readers would like this adventure, especially ones interested in Germany. Zook has given us a great deal of description and history about the area so young readers will learn while they are being entertained. Alexander and Gabe have terrific dogs that understand lots of commands and help the boys in their investigations. The first half of the book was a little slow, I thought, so continue to the second half where the action really ramps up. I was a little unhappy with the relationship between Alexander and Gabe. They fought a great deal. It was good to see that they did come to the point of working together when the danger hit. They know all kinds of great skills, like rock climbing and lock picking. An incredibly well written adventure story! Both Gabe and Alex are very realistic youngsters. They have a normal relationship with each other fights and disagreements included. I really liked the relationship that they had with their parents though. The fact that their father has taught them a lot of wonderful survival skills was apparent and very helpful as they faced excitement and adventure. This story reminded me a lot of the Hardy Boys Mysteries that I read growing up. An added level of enjo An incredibly well written adventure story! An added level of enjoyment for me was all the descriptions of Germany and things there. My husband and I spent 6 years in West Germany with the U.S. Air Force and this book brought back a lot of memories for me. This included the region, the way houses were furnished and a lot of the food. The descriptions were very accurate. I was fascinated with the explanation of the training they had given their dogs. I had no idea what type of instructions could be given using specific key words. The level of tasks they were able to get both Thunder and Lightening to do for them amazed me. This book is out of my normal genre yet with a newborn grandson it's not too soon to compile a list for him to read. Escapades for two brothers and their dogs, Thunder and Lightning on vacation in Germany with their parents fills The Secrets of the Castle. Gabe opens in first person with a scary ride on the Autobahn in their van, the Go Mobile. On their way to visit two castles he and his brother, Alex have studied in homeschool Gabe is certain a hidden tunnel connects the two. What transpires t This book is out of my normal genre yet with a newborn grandson it's not too soon to compile a list for him to read. Escapades for two brothers and their dogs, Thunder and Lightning on vacation in Germany with their parents fills The Secrets of the Castle. Gabe opens in first person with a scary ride on the Autobahn in their van, the Go Mobile. On their way to visit two castles he and his brother, Alex have studied in homeschool Gabe is certain a hidden tunnel connects the two. What transpires the rest of the trip will create vivid scenes in your mind. As mystery and intrigue follow the boys and their dogs the pages fly by. The camaraderie and competition between the brothers plus their parents' parenting style add to the appeal of this novel. I highly recommend The Secrets of the Castle for preteens. Aaron Zook will be on my list of authors for my grandson and the rest of his books in this series, Thunder and Lightning! A brand new tire blows on the German Autobahn...freak accident or felonious activity. And so begins The Secrets of the Castle, first in the Thunder and Lightning series of books for pre-teens and young teens. Intrigue and mystery follow two brothers, Gabe and Alex, on a seemingly innocent family vacation to visit a couple castles in Germany. Kidnapping, a runaway horse and carriage, hidden caves and threatening notes keep the pages turning. Readers are entertained too by the antics of the boys' A brand new tire blows on the German Autobahn...freak accident or felonious activity. And so begins The Secrets of the Castle, first in the Thunder and Lightning series of books for pre-teens and young teens. Intrigue and mystery follow two brothers, Gabe and Alex, on a seemingly innocent family vacation to visit a couple castles in Germany. Kidnapping, a runaway horse and carriage, hidden caves and threatening notes keep the pages turning. Readers are entertained too by the antics of the boys' dogs, Thunder, the humungous mixed breed Great Dane and Lightning, the petite Shih-Tzu/Whippet who runs as fast as a cheetah. Can the boys find the strength and courage to overcome the dangers they are in? Can they find a way out of the hidden cave? Will God answer their plea for help? Author Aaron Zook has written an exciting story with believable (yes, the boys bicker!) characters and a fast paced adventure that will have readers eagerly waiting for the next story in the series. The Secrets of the Castle is about two brothers, Alex and Gabe, and their talented dogs, Thunder and Lightning. Alex and Gabe are on a homeschool field trip with their family and the family of their friends, Jenna and Peter. The families are living in Germany and visiting Neuschwanstein castle. My 10 year old daughter loved this book so much that she has read it multiple times. She enjoyed the descriptions of the rolling hill country and ancient castle. The boys had a realistic brotherly relatio The Secrets of the Castle is about two brothers, Alex and Gabe, and their talented dogs, Thunder and Lightning. Alex and Gabe are on a homeschool field trip with their family and the family of their friends, Jenna and Peter. The families are living in Germany and visiting Neuschwanstein castle. My 10 year old daughter loved this book so much that she has read it multiple times. She enjoyed the descriptions of the rolling hill country and ancient castle. The boys had a realistic brotherly relationship full of teasing and rivalry. Alex and Gabe have a tight-knit, Christian family as well as close friends. My daughter loved the mystery and suspense. I would definitely recommend this book and will seek out other titles by the author. Gabe and Alex with their dogs Lightning and Thunder find themselves get involved in a mystery about two castles, secret tunnels, and some very mean men. The mystery in the book is very intriguing, and the story well written. With the addition of two amazing dogs, this has everything a kid would want in a read. I enjoyed this book, but my daughter is probably going to be raving about it! Finding good interesting reads for middle age readers isn't easy, and finding ones written with a Christian pe Gabe and Alex with their dogs Lightning and Thunder find themselves get involved in a mystery about two castles, secret tunnels, and some very mean men. The mystery in the book is very intriguing, and the story well written. With the addition of two amazing dogs, this has everything a kid would want in a read. I enjoyed this book, but my daughter is probably going to be raving about it! Finding good interesting reads for middle age readers isn't easy, and finding ones written with a Christian perspective are even more difficult! I'm excited to see what my twelve year old daughter will think of this mystery. I truly enjoyed it myself. I received this book through bookfun.org for my honest opinion which I have given. This is a fantastic book! Brothers, Alex and Gabe, find themselves in the middle of a mystery while on a trip to Germany. I love the descriptions of the castles. The characters are realistic, likable and relatable. I appreciate that they are homeschooled as I homeschool my sons. The story is well written and will keep your attention. I think boys and girls alike will enjoy reading this book. Actually, anyone who enjoys a good mystery will enjoy this adventure. I highly recommend this book and ha This is a fantastic book! Brothers, Alex and Gabe, find themselves in the middle of a mystery while on a trip to Germany. I love the descriptions of the castles. The characters are realistic, likable and relatable. I appreciate that they are homeschooled as I homeschool my sons. The story is well written and will keep your attention. I think boys and girls alike will enjoy reading this book. Actually, anyone who enjoys a good mystery will enjoy this adventure. I highly recommend this book and have already recommended it to several friends. The Secrets of the Castle is an quite an adventurous read. With a mixture of action, mystery, suspense, and of course, the adventure, it was hard to put down. I received this book from bookfun.org in exchange for my honest opinion, which was given. Thank you Aaron Zooks Jr for signing this book for me when you came to Fort.Hood last weekend. This book is an excellent adventure in Germany. Exciting and well written for this age-group! About Aaron M. Zook Jr.
Books by Aaron M. Zook Jr.